Watching the life cycle of caterpillars and butterflies is amazing--even more so for preschoolers! Use this caterpillar and butterflies theme to teach concepts throughout your curriculum. 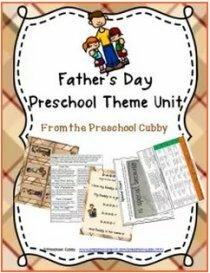 This theme is endless in the possible activities and adventures your preschoolers can participate in! Caterpillar and Butterflies and their classroom homes can be purchased through Amazon. Here are the two items I've used. NO Caterpillars Included but you can add $5 for caterpillars to be sent! Let the Caterpillar and Butterflies Theme planning begin! 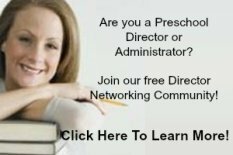 You can either scroll down through this page to see all of the preschool activities for your Caterpillars and Butterflies Theme or click the link below to go to the specific preschool lesson plan or activity type you are looking for. Looking for a Bugs and Insects Theme? The children color the coffee filter. The more they color it the better! They then drop water onto the filters. This will spread the color out and make some pretty remarkable looking color collages. When dry, pinch filter in the middle and wrap a piece of pipe cleaner on the pinched part. VARIATION: Use the pinch type clothes pins instead of pipe cleaners. The children and add antennae and small googly eyes on these. VARIATION #2: I've not tried this yet, but it was suggested to pre-pinch the coffee filters and instead of the children coloring them with markers, you provide to them a variety of cups with water and a large amount of food coloring (or liquid watercolor) for them to drop onto the filters. Either variation will make many of your students want to make many of these butterflies! Encourage them to try using 2 primary colors only (like red and blue) and see the different types of purple that can be made when the water is added! Materials Needed: cardboard egg cartons (cut so that 3 cups are still connected in a row); pipe cleaners, googly eyes, glue, glitter, sequins, etc. The children decorate their caterpillars any way they want to! When the glue is dry, hang all of your caterpillars from the ceiling. After a few days, before the children arrive, wrap each one with green tissue paper as a chrysalis! 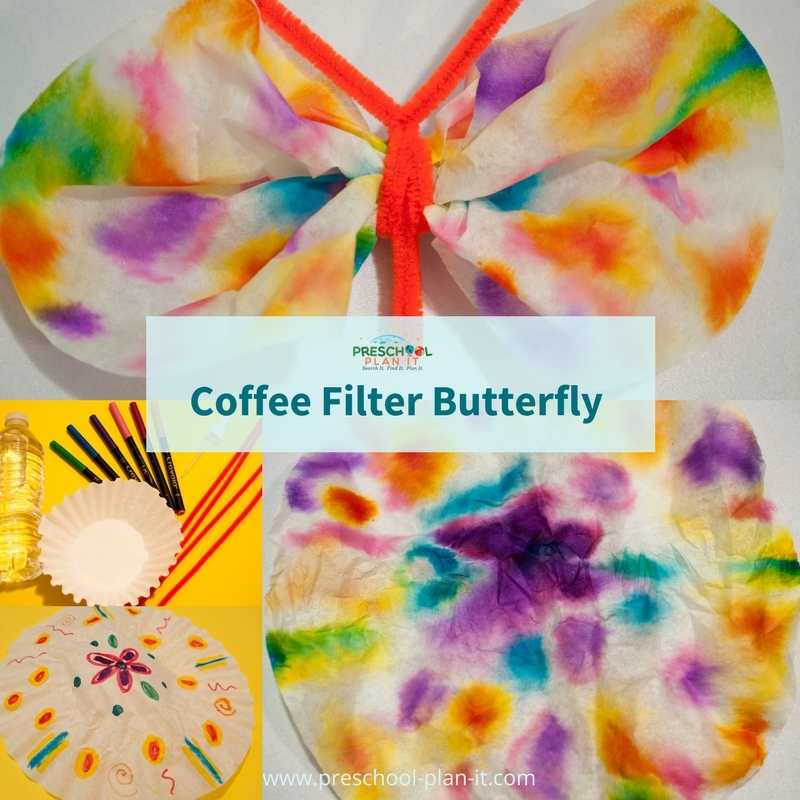 Have the children make the coffee filter butterflies as above, but don't pinch the middles. When those are dry, remove their caterpillars from the ceiling and have them add their coffee filter wings and some pipe cleaners as legs to make a butterfly! Add plastic caterpillars and butterflies as well as green fabric for the children to make safe places for their butterflies! Once the children are familiar with the story The Very Hungry Caterpillar, talk about the ending. 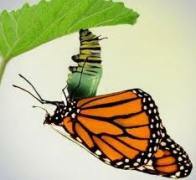 The caterpillar turned into a butterfly! Ask the children what types of things they think that butterfly did! Start them off with "Now that I am a beautiful butterfly, I think I will...."
Give each child a turn to add to the story. When done, type in print one copy for each child (with their name in parenthesis under the part of the story they added). Read THEIR story to them the next day and tell them that they are going to be illustrators (explain what that is). Tell them they need to create a book cover for the story! Attach a copy of the story to each of their illustrations to take home. Snack Recipe Ideas to Cook Up for Your Caterpillars and Butterflies Theme! Have a taste test of all the foods in the Very Hungry Caterpillar book. Make a chart with each food listed in a column on the left side. Make two more columns next to that one- one that says YES and one that says NO. Label the chart: Do we like what the Very Hungry Caterpillar Ate? 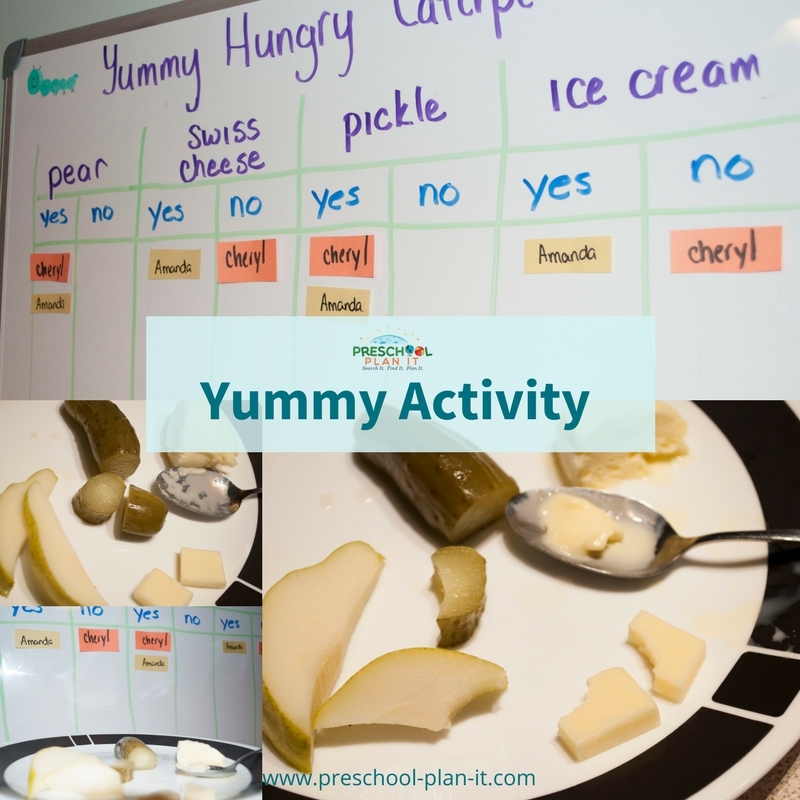 In advance, print each child's name as many times as the types of food you have listed on the chart. As each child tries each food, ask if they like it. Then ask them to place one of their premade name tags under either YES or NO. Which food did most children like? Dislike? Which has 3 names? Four? Materials A small white sheet (for the egg stage); Striped fabric (for the caterpillar); green fabric for the chrysalis stage and butterfly wings. Have the children take turns being each stage. Ask "what happens next" etc. Have extra butterfly wings available so that the children can pretend to fly away together to have adventures! 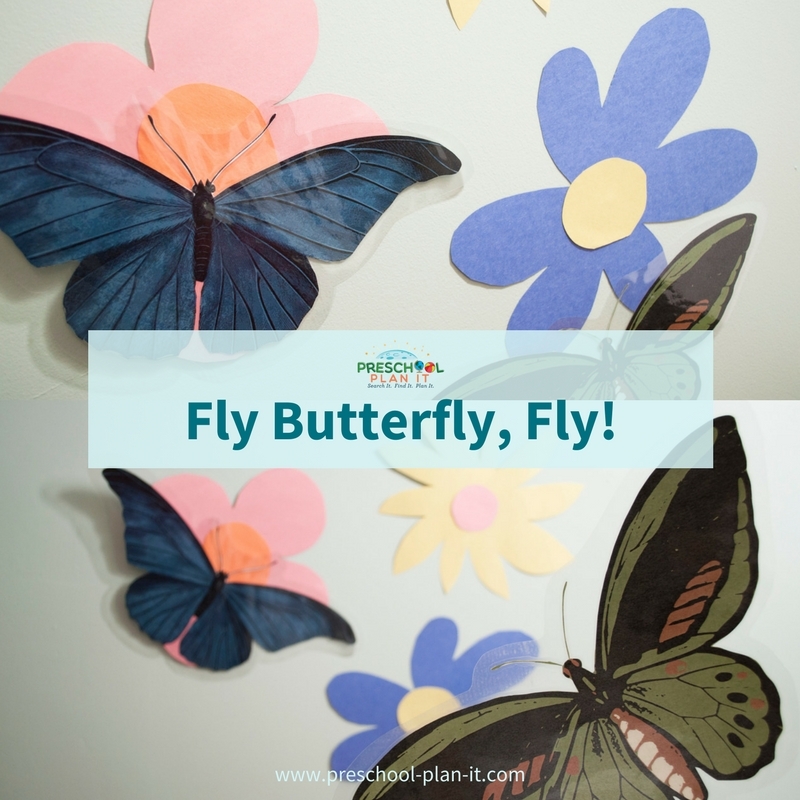 Hang pictures of a variety of butterflies around the room and near the easel to encourage ideas for butterflies to paint! Materials: A large, laminated butterfly for each child (or plastic ones! ); construction paper of various colors cut out into the shapes of flowers. Fly and land ON the red flower. Fly and rest UNDER the blue flower. Make up as many as you can! The children can "fly" and get some exercise, learn colors and learn spatial relationships all at the same time! The following books are available through Amazon by clicking on the title. Also: Check with your local library to find which types of butterfies are native to your area and to find books on them! Fuzzy little caterpillar crawling on the ground (make a finger crawl on the floor). Spin yourself a blanket and then go fast asleep (Twirl on finger around and around in circles then tuck that finger into your other hand). The long weeks are over and you'll be hatching soon. Nothing but chew and chew! Nothing much but how to grow! Will make them become a butterfly. However much I chew and chew! Caterpillars and Butterflies Theme activities to help your Preschoolers develop their math skills and those small muscles in their hands! Materials: Bring in the types of food in the story The Very Hungry Caterpillar that have seeds (apples, pear, watermelon). Ask the children how many seeds they think are in each? 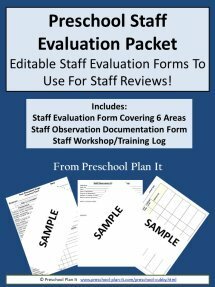 Write down their estimates. Open the fruit and remove the seeds and put them in separate bowls and count the seeds! 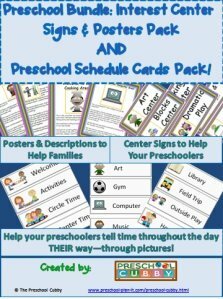 Make pairs of cards with matching stickers on them and laminate. The children can use these as a concentration/memory game or as a matching game. VARIATION: Rather than stickers, find pairs of pictures (in magazines or online) to use for this game. 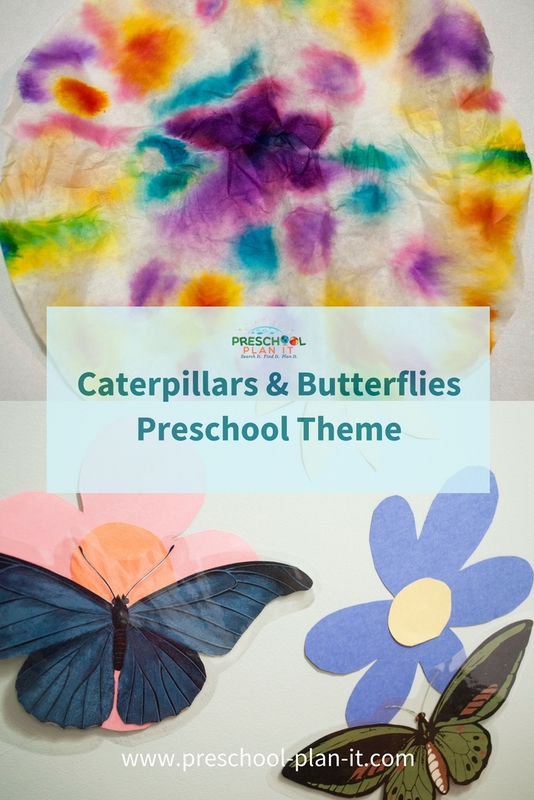 Caterpillars and Butterflies Theme Music and Movement Activities and Ideas to get your Preschoolers Movin' and Groovin'! If I were a butterfly, I'd thank you Lord for giving me wings. if I were a robin in a tree, I'd thank you Lord that I could sing. If I were a fish in the sea, I'd wiggle my tail and I'd giggle with glee. And I just thank you Father for making me, me. If I were an elephant, I'd thank you Lord by raising my trunk. If I were a kangaroo, you know I'd hop right up to you. If I were an octopus, I'd thank you Lord for my fine looks. If I were a crocodile, I'd thank you Lord for my great smile. See how they crawl? See how they crawl? It's a sight that you wouldn't want to miss! When they become butterflies. When they become butterflies! Caterpillars and Butterflies Theme Activities for the Senses! Caterpillars and Butterflies Theme Science Activities--for your Preschool Scientists in Training! Place magnifying glasses, small bug containers with plastic caterpillars and butterflies in them and several non-fiction caterpillar and butterfly books in your science center. Materials: Order caterpillars so that you and your children can watch the life cycle. There are many companies who sell these. Ask for references for local places from your local librarian! Once your caterpillars form their chrysalis, make a paper chain with the children to count how many days it takes for them to become a caterpillar. Add a chain each day. This typically takes a couple of weeks. Materials needed: straws with the white straw paper still on them, water, eye dropper, flat, shallow pan (like a cookie sheet). Rip one end of the paper off the straw. Place the unopened end of the straw on the cookie sheet. Now the paper should look somewhat like a caterpillar! Drop a few drops of water into the tunnel of the paper and IT WILL MOVE like a caterpillar! It's pretty cool! Repeat as interested OR......provide one straw to each child for them to try at the science table! 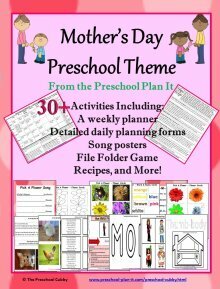 Writing Activity Ideas for Your Preschool Classroom's Caterpillars and Butterflies Theme! Materials Needed: stencils of caterpillars and butterflies, sharpened colored pencils (or markers that fit in the stencils). 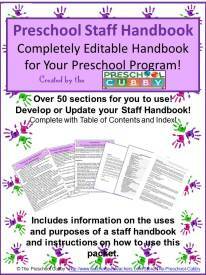 Encourage the children to trace onto paper and color in and dictate stories about their tracings. Ask questions such as: Where do you think this butterfly will go? What would it do there? Then what would it do? Does it have any friends? Are they also butterflies? Many preschool teachers like to take their students to a local Butterfly Pavilion. I personally do not think this is a good idea. One of the rules of this place is that you are NOT to TOUCH the butterflies or hit them...ok, nuff said? This rule does not work out well with preschool children who have BUGS, as far as they are concerned, landing on them! I would recommend letting your students' parents know where there is a place so they can take a one on one field trip, but I would not do this as a group school situation. You could, perhaps, see if this local place can bring the field trip to you! There is so much to see, just enjoy being outside where butterflies live, even if you don't see any! Looking for the Bugs and Insects Theme?